Cops shoot two dogs outside highschool at lunch hour!!! Today we are bringing you a new format. Our blog has gone video. Check out the first installment of “Everything Worth Knowing Rescue News” please DO comment and tell us what you think! PS: Here’s the link to the funding campaign! For the past week or so we have been talking about cops who shoot dogs. The subject has gotten pretty heavy as we bring you the numerous accounts of innocent family pets murdered at the hands of law enforcement, so we thought that today we would move away from the subject a little and talk about something we all know and love, the family dog. As most of you that read me regularly know, I have eight furry family members. I allude to them often, but I don’t think we have introduced them all to you yet. That is why today in the hopes of lightening things up a bit, I have decided to introduce you all to my dogs, tell you where each of them came from and why it is so important to support rescue. Seven years ago this coming Mother’s day we were shopping at a local flea market. We came across a booth in which sat two tiny puppies. They were just tiny balls of fur really, one pitch black, the other bright white. We had no intentions of getting another dog when we left the house that morning, but when I saw the little bundle of white fur I fell in love. Mystral was born in our home on January 24, 2007. On January 24, 2007 our dog Ebony (R.I.P) gave birth to eight puppies. She had been impregnated by a stray that entered our yard just before her scheduled spay surgery. When the puppies were born I have to admit we were a little overwhelmed. After all there were already three adult dogs in our home, and one soon to be adult (Harley) so adding another eight brought us to an even dozen. It was a mad house but we got through it finding good homes for all but one puppy. The last one we kept. We named her Mystral, but she would become known as Mysty. Mysty is a shy unassuming dog who much prefers a good cuddle to boisterous play. Mysty tends to get lost in the shuffle sometimes because she is a well behaved dog who never does anything wrong. She just had her sixth birthday last week. In November of 2007, we bought a new house and moved four doors down the street in the same neighborhood. Believe it or not we actually moved to give our dogs more yard space in a yard we could completely fence. Our fifteen year old dog Gabrielle made the move with us, but she was not doing well. She had started having seizures and I knew her time was coming. I had, adopted Gabrielle fourteen years earlier unable to give her up after fostering her through the healing of wounds she received by being dragged behind a motorcycle down a dirt road as punishment for peeing on her owners kitchen floor. My husband and I got married in July of 2008. Gabrielle was with us for the wedding but shortly after gave up the fight. By August of that year she had crossed the rainbow bridge. Gabby was an amazing dog and even though she has been gone for years now, not a day goes by that I don’t think of her and miss her. I include her here because even though she is gone, in my memory she will always be part of our pack. Nakita a Husky/lab cross was labelled a “pit bull” by a local SPCA worker bringing an end to her advocacy work. After Gabrielle’s death there was a void in our life. I never really thought of getting another dog until in December of that year I got a call about an eight week old puppy. The woman who owned her was getting rid of her after two weeks because she could not handle the boisterous pup. She could not find anyone willing to take the eight week old puppy so close to Christmas, and was ready to drop her off at a shelter. We drove out of town about forty minutes and picked her up. Little did I know it but she would become my constant companion at a time when my heart was still grieving for my beloved Gabrielle. We named the puppy Nakita. She became an integral part of my rescue work, helping me to train the rescues that came through our home, and accompanying me when we spoke to children and their parents about dogs.. All that would come to a crashing halt in the spring of 2010 when an SPCA worker from the local shelter labeled her a “pit bull.” I was already in the fight against BSL in Ontario, but when my own dog became effected I redoubled my efforts. Speaking out against BSL is what lead me to meet many of you fine people! Wow! Look how long this post is getting! Okay one more dog today, then I will tell you about the other half of the pack tomorrow. Chester is now somewhere in the range of 15-17 years old. In the winter of 2010 I received a call from a friend. Upon going to work that morning she had found a box containing a senior Chi-pom outside the door of her local business. The night before the temperatures had reached an icy -22 C. When she opened the box she found the little dog alive, but just barely. Rushing him to the vet, she called me. I met her at the vets office and we found that although cold and neglected, the little dog would live. Now came the problem of what to do with him. My husband and I took him in knowing full well he would probably be with us for the rest of his life. The vet had estimated his age as somewhere between 13 and 15 years of age. Two years later, the little dog is still with us, and although he has bladder control problems and must wear a belly band in the house he is perfectly happy and healthy otherwise and still has a few more years of good life left. We named him Chester, and he will live with us until it is his time to cross the bridge. You can count on us to bring you the unvarnished truth of the matter. From persecution and killing of citizens to the killing of innocent family pets, David Vara is determined to expose corruption in the Rochester New York police department, and we are determined to help him. “But you advocate for dogs,” you might say. “Why are you throwing your support behind this issue?” We are throwing our support behind this issue because yes we DO advocate for dogs, but we also believe that ALL citizens should be able to expect to live their lives free from persecution by those who are supposed to be dedicated to protecting them! But we are not going far off the mark with our support of Davy V. after all are we not all aware what a prevalent problem the murder of innocent dogs by police is becoming in the US? If you have been paying attention you know this is a rising trend. What’s worse, most cops get away with it, no questions asked, no accountability! Our main question here is this, what makes a cop above the law? If any of us went out entered a persons home without a warrant and shot their dog we would be slapped with felony charges. Cops can shoot a dog, treat the dog’s owner like a lunatic when they become distraught and then just go claim that the dog was behaving aggressively, and get away with the whole thing! How is this serving and protecting the public? That’s just it, it isn’t. Have we given police too much power? More than likely, but changing that will not be easy. Governments always side with the cop, in their eyes cops can do no wrong and ordinary citizens are the ones to suspect of subterfuge, after all why would a cop lie? Why would a cop lie? Perhaps to avoid repercussion and seem as if they were in the right? After all most of them are on a power trip anyway. They figure that the law will support anything they do, and the sad thing is they are usually right. The only way we can combat this is to get the story out there. That is the reason we are in support of Davy V. and his expose’ video. Mainstream media won’t touch this issue, and many think that is because it isn’t really happening. That is erroneous thinking. The mainstream media won’t touch this issue because mainstream media only tells you what the government wants you to know, and the last thing the government wants you to know is that they allow law enforcement to operate above the law! Independent film makers like Davy Vara, and freelance journalist like myself march to the beat of their own drum. We do not allow the government to tell us what to print or film. We report the issues as we see them. We push the truth. For that many call us fanatics, many try to discount our truths, and discredit us with personal attacks. We are thick skinned, we ignore them and continue to spread the truth of the matter without polish. Quite frankly we can be pretty blunt about it, we don’t sugar coat the issues to make either side look rosier than the other. You can count on us to bring you the unvarnished truth of the matter. I f you are behind Davy V. as much as we are please download and share this Facebook cover photo to show your support! The time has come for you to be held accountable for your actions, and we are here to see that you are! We told you about the execution of Codi a “pit bull” shot in the back of the head by an officer who lied and said the dog was charging him in a threatening manner. We alluded to other cop shootings of dogs that were unjustified and amounted to nothing more than an execution. This morning Davy Vara woke to some pretty nasty emails from the cop community. This is not surprising since we expect nothing less from cowards who shoot innocent animals, but it does tell us something, it tells us Davy Vara speaks the truth! In my experience if you are going to spread truths there will always be someone who tries to suppress them. It doesn’t mean that you are not spreading truth, it simply means that your enemies are afraid that your message is getting through! Davy Vara’s message is getting through, and for some (mostly murderous cops) that is a problem. They don’t want you to know that they have declared war on the family pet. They don’t want you to know that they are trigger happy, they don’t want you to know the truth. WE want you to know the truth. WE want you to help us stem the tide of dog shootings by cops, and for that reason we support Davy Vara’s efforts and strongly encourage you to do so as well. We are not going to have some long ridiculous argument about the facts, we have already researched them and are comfortable with our conclusions. Besides ignorant delusional persons are impossible to argue with. They will always take the most irrational argument and run with it simply because they don’t possess the skill set required to look at the facts and draw a reasonable and informed conclusion. This is not unusual as in my experience those who cling stubbornly to opinions based on hearsay, are incapable of original thought. FACT Family dogs are being executed. FACT Most of these shootings are unnecessary and could have been avoided. FACT Cops need to be educated on the handling of any animals they may encounter in their daily work day. FACT Cops need to be held accountable for using their service weapons no matter WHAT their target may be. FACT Police departments need to be educated to the depth of relationship between citizens and their pets. It’s not “just a dog” and after you have erroneously shot someone’s beloved family pet “Calm down, you can get another dog.” is definitely NOT good public relations. I could go on posting these factual news stories all day, but I think you get my point. And for those of you who don’t, it is simply this; Please don’t insult our intelligence by trying to intimate that EVERY time a cop shoots a dog it is justified. Fact is, more often then not it isn’t! For those of you out there who think intimidation tactics such as those you employed with my friend Davy Vara this morning will silence those of us who speak the truth, think again! We are dedicated, dedicated to exposing your corrupt slaughter of family pets, dedicated to making a change. Dedicated to ending your war on the family pet. We don’t back down, and we won’t go away. The time has come for you to be held accountable for your actions, and we are here to see that you are! David Vara rallies against the shooting of dogs by cops. His name is David Vara a community activist in Rochester, NY exposing police misconduct and corruption. For years, Vara’s work consisted of being a voice for innocent, unarmed citizens who have been killed by the Rochester, NY Police department. Now, Vara finds himself becoming a voice for innocent family pets, dogs who are being executed by trigger-happy police officers. In the last 7 months three innocent family dogs have been executed by the Rochester, NY Police department, the Gates, NY Police department and the Monroe County, NY Sheriff’s department. Despite the fact Vara has held several rallies denouncing these injustices, and an outrage from the community, the killings of these pets is always ruled justified. Rochester, NY Police Officer Chris Burgstrom, shot Codi in the back of the head and then lied saying the dog was charging him in an aggressive manner. In the following exerpt from his blog Vara tells us about the shooting of Codi an innocent 1 1/2 year old “pit bull” who had the misfortune of wandering away from home, and never returned because he was shot in the back of the head by Rochester NY Police Officer Chris Burgstrom. Yes that’s right I said shot IN THE BACK OF THE HEAD! Here is the story in Vara’s own words. Steven Jodoin Benus says he must have covered 100 miles over the last couple of days looking for his best friend Codi, a 1 1/2 year old pit bull terrier. On Monday January 7th, when Steven took his friend home after they had gone ice fishing, Codi got out and wandered off. Steven barely got any sleep looking for his beloved dog that night. After posting an ad in the lost and found section of Craigslist, Steven and Ranger, Codi’s brother, searched everywhere near near his Greenleaf Rd. home in Greece, NY. They looked through fields, streets, a golf club and the Greece, NY animal control. The next day, Tuesday, with just a few hours of sleep, Steven was up at 4 am, continuing to look for Codi. Steven then went to Rochester Animal Control on Verona Street near downtown. An employee walked him back to the cages housing dogs, most of them pit bulls. But no sign of Codi. Before leaving, Steven filled out some forms describing what Codi looked like. Wednesday morning, Steven got a call from a woman who had seen the Craigslist ad. The woman told Steven that on her way to work Tuesday, she had seen Codi near Abbott’s ice cream on Lake Ave. near Lake Ontario. Steven raced there, but once again, disappointment set in as there was no sign of Codi. Then, Steven went back to Rochester animal control on Verona St. to see if Codi may have turned up. It was then that Steven learned what had happened to his best friend. An employee who overheard Steven describing Codi, pulled Steven aside and told him that Codi had been shot and killed by Rochester Police near the Lake Ontario pier. Too distraught to see his best friend, Steven’s mom later went to Verona St. and identified Codi. “My mom said he had a bullet hole behind his shoulder, that was a kill shot. He was my best friend.” Steven told me as we sat down at Tom Horton’s in Greece, his eyes watering. He told me about how he and Codi met. Codi was just 5 months old when Steven rescued him from a home near his job on Rochester’s northeast side. “I actually saw Codi being born, then as he grew I realized he wasn’t being taken care of. His collar was gouging his skin, he was dirty, he had fleas and worms when I got him.” said Steven. Then Steven told me something about the first time he had gone to Rochester animal control to look for Codi, when he was taken back to see all the dogs. “They were all barking and their ears were cropped, they had the big collars on, and looking at them you could just tell that they had a rough life.” he said. And as I sat there with Steven I realized just how much he loved his best friend. I also couldn’t help but think how ironic it was that Steven had rescued Codi, a beautiful dog, so he wouldn’t end up like those dogs Steven saw in those cages, only for some trigger-happy Rochester Police officer to shoot him before Steven could find his best friend. Upon viewing the video we can clearly see that the smaller entrance wound is in the back of the dog’s head with the larger exit wound in the front. This tells us Codi was clearly shot from behind execution style. It also refutes Burgstrom’s claims that the dog was charging him in an aggressive manner when shot. Davy Vara drew the same conclusion. He is now trying to raise funding for an expose’ film on cops who shoot dogs. We think this is a very important film that needs to be made. As such we are asking all of you to help us by supporting Davy Vara and contributing to the funding campaign. We MUST stem the tide of cops murdering innocent family pets. “Law Enforcement Stop Killing Our Innocent Family Pets!” fundraising campaign”. UPDATE: In response to this blog post a couple of readers have posted links to petitions. I thought I would include them here for those of you with no time to read the comments. Institute Training For Police Officers In Handling Unfamiliar Canines. Both of the above are important petitions to sign if you are concerned about cops shooting dogs please support them both by signing and sharing! I just need some time to charge my positive side! It was the last straw. I have to step away and work offline for a while. 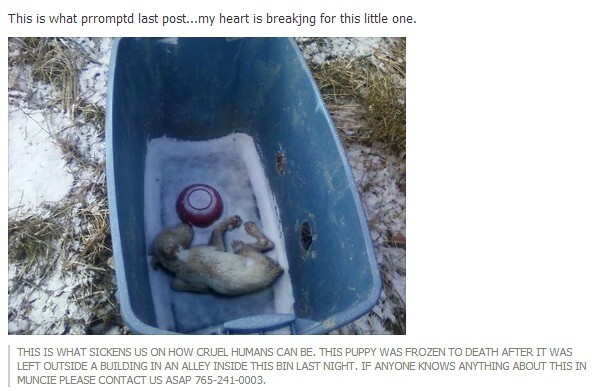 I actually cried looking at this photo and reading the story of this poor puppy frozen to death. I need to regenerate, to go and hug my dogs, play with them, interact with them, get away from people for a while. I know that sounds horrible but it’s true. I have been doing this rescue thing now for a good long time, and if there is one thing I know for sure, when you feel this way it is far better to step away for a while and regroup than to continue on and burn out. So I will be back tomorrow with an interesting article on a film maker in Rochester, New York whose tired of cops shooting dogs and plans to do something about it! Be sure to catch Saturdays special blog about a man in Brooklyn whose saving innocent dogs from the hands of dog fighters, sometimes at risk of injury or death! As for me I just need some time to charge my positive side!